Swimming and Swim teams are one thing that do not always go hand in hand. Then again planes and plane crashes are also two things don’t always go hand in hand. Survival in the Wilderness as a teenager with three young children in your care are also items that do not mix generally. However, for Avery and Colin these three things comes crashing together one cold November day as they are heading home from California to Boston for Thanksgiving break. I’ve read numerous plane crashing in the middle of nowhere type fanfiction stories with Bella and Edward (Twilight) at the helm, and this time I could almost see those two as Avery and Colin. Opposite ends of the spectrum but closer than they can imagine. They find a way – and it’s this shared trauma that brings them together in the end. So how does one begin to overcome this kind of tragedy? How do they begin to move-on and re-start their lives? Avery and Colin have to find that way – this is their story of post-traumatic survival and the new life they forge for themselves. A story beautifully written always keeping the plan crash at the edge of your consciousness – we walk with both Avery and Colin as they deal with their respective demons and come out better people. Four out of Five Stars for Girl Underwater as I felt some of the characters were a little flat and predictable. Claire Kells was born outside Philadelphia and has lived in Boston, Chicago, and San Francisco since graduating from Princeton University in 2005. An English major, she didn’t start writing fiction until her first year of medical school. Now a second-year resident in the Bay Area, she spends her free time writing stories about love, loss, and adventure. GIRL UNDERWATER is her first novel. Get Your Copy of Girl Underwater NOW! Archeology has always been a love of mine – there’s something inherently interesting to me to learn the hows, whys and whats of the past – though I never did go into the field as a career, I have always managed to find ways to dip my toes into it via reading, watching documentaries, or visiting museums. I never really took the time to delve into the past as much as Griffin Clonmac. An Archeologist and college professor known for his TV appearances and discoveries takes his love of the past to a whole new level – battling unseen political and personal forces to dig up and raise the Bridge and the Clonmacnoise Monestary. There’s a mystery even bigger than he is lurking in the waters of the River Shannon…at every turn he takes one step forward and seemingly hundreds backwards. This book is one of back and forth – push and pull – and constant battling between the main characters. There’s someone in the book, a Modern – Day Priest who will stop at nothing to keep the bridge from being raised – his whys behind the desire to stop it do not come to be known until late in the book – and while they seem petty and drawn out, they do make sense. I am going to give this book a 3 out of 5 Stars – the constant back and forth and stop and go that Griffin deals with almost seems forced at an attempt to make the book seem like there’s more to it than there actually is. WOW Another year gone…how quickly the year passes the older we get, no? Seems the years just fly by and end up weaving one right into the other without so much as a note. As a child we wait anxiously for our Birthdays and Christmas, but as an adult we wish the days and weeks would just slow down some so we can relish in those hours and minutes. Just taking time to absorb everything we’re experiencing in that moment. Let’s see, this year brought with it another Camporee with the Girl Scout Troop, a Visit to Maryland to meet and Greet the newest addition to our family, my sister’s adorable baby boy Lucas, and a nice visit from Mom & Dad during one awesome weekend! So let’s see Camporee this year was held in April this year – the theme was Disney and our troop decided on the movie Sleeping Beauty! It was a wonderous weekend full of crafts, activities, a scavenger hunt, and yummy Smore’s! The girls had a chance to dress up as a Disney Character prior to the Scavenger hunt! They loved it! Then after Camporee, the following weekend, we went to Maryland to meet Mr. Lucas! He was just two weeks old here, and now we’re getting ready to head north again to spend Christmas with the family, his 1st! We are excited about that and celebrating Ashley’s birthday while there. However, before heading back to NC, we spent some time on the farm with my brother and his Girlfriend, Dana, visiting with her horses! The kids always love seeing the M&M’s as they are called! After our trip to Maryland, Mom & Dad did make a trip down to visit with us over the summer, we spent an afternoon touring Screen Gems studios, which was exciting in itself! We spent time touring the sets of Under the Dome and seeing some left over props from Journey 3! Was a very coold afternoon! Then last but not certainly least over the summer our Girl Scout troop took a weekend camping trip in Tabor City to Scooby’s! The girls spent a full day swimming in the pool, playing at the water park, and having a great time! Was an all too short weekend, but it was super fun! So that wraps up the events of our year! Jimm left his job in June after an injury in the salon in April. He’s ok now, but still looking for work. He’s happy though in the meantime being a Stay-At-Home Dad! The house and kids are well looked after, so I can’t fuss…though I am sure he’d prefer to be working – I believe right now we need him at home more…in time though that may change. Lara left her position in October with her company – she wasn’t unemployed long though – a staffing agency got her in with a State Government agency temporarily and then within a few days of leaving that position she obtained a new job working for another company similar to her last as a field administrator working on site for their contractor. In July after Jimm left his job she also opened her Etsy Shop, YarntoAfghanCreations, in an effort to drive income into the household. Thus far sales have been slow but steady! Austin wrapped up 6th Grade as steadily as they come, we hit some speed bumps along the way but he was no worst for the wear. And has kicked off 7th Grade with a BAM! He’s blossoming in Band and just loving playing the trumpet, he’s got a real knack for it and it just a natural musician. Ashley wrapped up 4th grade with honors and spent a week at Girl Scout camp before starting 5th Grade at the end of June when her elementary school went to a year-round schedule. She’s doing wonderfully and is gearing up for her next intercession! Otherwise, all is doing wonderfully in the Girdler household, we’ve hit a few snares along the way, but nothing we can’t handle! Hope Everyone has an Amazing Holiday Season, a Safe and Prosperous New Year and we’ll See Everyone later! Lucky Dey, an on-again/off-again Los Angeles County Sheriff’s detective is both willful and acerbic to a dangerous fault. While in a holding pattern for official reinstatement, Lucky accepts a one-time private detective gig to track down the missing teenage daughter of a Midwestern software millionaire. This first Lucky Dey Novel winds its way through an L.A. landscape where the lights are bright, but the edges can be dark, perilously frayed, and populated with mix of human predators, amusing losers, and ambitious fringe dwellers. Lucky Dey is a down on his luck former cop hoping to get back in to LA County Sheriff’s office and while waiting he’s recommended to a mid-western software millionaire to try and find his “missing” daughter – it doesn’t take Lucky long to figure out she ran away from home – but her reasons are left on the back burner until the very end of the book. The author takes the reader through many twists and turns while revealing the much darker side of LA. All glitz and glitter to the outside tourist those who work the “streets” know that LA isn’t everything is appears to be on the surface – 99 Percent Kill brings every dirty little secret of LA to the surface in a wicked thrill ride of a book. 4 out of 5 Stars for 99 Percent Kill! Doug has written five novels to date: DARK HORSE, TRUE BELIEVERS, THE SAFETY EXPERT, BLOOD MONEY and 99 PERCENT KILL. Doug continues to write and develop for feature films and television. Euro-trash collides with American gangsta in Maryland’s gleefully cheesy beach resort as reporter Jamie August befriends a spoiled Eastern European heiress. Russian mobsters are gunning for the party-girl daughter of an oil tycoon, who has meanwhile paired up with chart-topping rap star Sniper Trigga. A raging boardwalk crime spree is keeping Jamie busy—and so is a hot new boyfriend and a strict jogging and frozen custard fitness plan. Action careens from OC to Dubai, from the wild beaches of Assateague to a wild-west themed campground. Will Jamie survive to debut her fringed leopard-print bikini? Interesting story, it kicks off giving background of who Jamie August is for those who have not read the book but the immediately jumps into the story. We get down to the nitty gritty of the action right off from the start! Jumping into one twist after the other, showing a slightly darker side of one of Maryland’s quietest vacation spots. Having spent a week here or there as a child in Ocean City, I remember bits and pieces of the area and am familiar with the references in OC and in and around Baltimore when the author moves the story accordingly – once outside of OC and Baltimore it gets shaky but she details the environment in such a way that the reader almost feels like they are right there with Jamie. A quick moving read and one that kept me questioning the next step or what is happening in the story – twists and turns that the reader doesn’t see coming keep us on edge! Four out of five stars as I did not fully comprehend the need for the trip to Dubai. I live in the Middle East, half a world away from my home state of Maryland. I caught the travel bug late, but I’m making up for lost time, having visited over a dozen new countries in the last four years. I love doing the kind of sightseeing that plunges me into new cultures, new cuisines, new ways of thinking and living. Middle Eastern expat life, too, is an interesting conundrum to consider–it’s neither American nor particularly Arabic. This so-called “Third Culture” has its own charms and challenges. Writing about my experiences as a traveler and, increasingly, as a happily settled expat, is a way for me to process what I have experienced and to share it. Writing about Ocean City, on the other hand, is a great antidote to homesickness. I’m sure some of my Maryland memories are whimsically inflated, just like the stories we tell about our own exploits back in the day: they get more farfetched with every telling. But the affection I have for the people, the food, the attitude, the sheer fun of Ocean City is real, and it gets me through the culture shock that will probably always be a part of expat life. If you are a woman who has either never set foot into the big-boys part of the gym aka the weight room, or even if you are a semi-experienced lifter who has been searching for a way to get out of a rut or even try and learn something new then this program is definitely for you! I began the program after working out on weight machines, free weights, cable towers, etc for months with no real progress – I’d heard of the book and the program but never took the initiative to try and do more “homework” I guess if you will into it. Finally, earlier this year I picked-up the book and jumped right in, reading the book cover-to-cover. It’s very well written and easy to follow and understand, Lou doesn’t talk down to the reader, nor does he outline the program in such a way that someone who does not have a basic fitness vocabulary can’t follow. Allwyn then has designed an amazing workout program that gradually increases in difficulty while forcing you outside of your comfort zone. Cassandra also outlines how to calculate macros and get the right nutrition to match-up with the program. Push-ups – the number of push-ups we are asked to do is WOW! There’s use for it, I get that, and there’s a not of ways they can help, But geez! The lack of arm-specific work, there’s a TON (I mean literally the whole program is nothing but) of full-body work, but nothing that works biceps/triceps specifically – I guess those planks and push-ups are meant to hit those areas. BUT on the flip-side I did see some advantages, I got stronger, leaner, and more physically defined as time went on. I became more self-aware and more aware of what I was eating. I found lifting became my main source of calm, if I felt my anxieties rising a trip to the gym and one of these workouts would bring me back down level again. I say lifting is a blessing for my soul! So all in all 3 out of 5 stars for the program, I’ve loved it, but the authors really need to find a way to do more than just Push-ups and Planks for arm/back/core work because HELLO not everyone can do these things! After six years at Men’s Fitness, the last three as fitness editor, he moved across the country to Men’s Health magazine, where he worked as fitness director until 2004. Since then he has written for a long list of magazines, including Men’s Journal, Fit Pregnancy, and Better Homes & Gardens. He also worked for a year as editorial director at T-nation.com. She also runs her own group fitness facility in Connecticut, which has transformed the bodies of hundreds of women and men across the state. John’s hit another one out of the park! As soon as I finished reading September Sky I knew I wanted to read this one! He’d hinted at the story line and it intrigued me from the off. He has a way of writing characters so that you become so immersed in their story that you don’t even realize you’ve begun reading a book. He just writes them that well. This time was no different, you see the journey of three modern-day women in the late 1930’s, a time when America was at a turning point and Europe was on the verge of war. The way American’s viewed German’s and the prospect of joining Hitler’s war was not something to be taken lightly. John manages to see this change in America from the viewpoint of three different generations – Amanda, the youngest, a historian who wants to think that there’s some good in everyone, trusts Kurt even though there’s possibly secrets there that could undo the fabric of their relationship. Susan, Amanda’s mother whose cynicism toward men and German’s might just over-rule her protective instincts when it comes to Amanda – all the while teaching her a thing or two about being a woman. And, then there’s Elizabeth, Susan’s mother who lived through WWII as a child – her memories of what America and the world were like during that time period may just lead her toward rash decisions. This story has many turns that keep the reader engaged – you want to know what’s going to happen to the main characters and see how they’ll interact with the pending war. John’s development of the characters and the world of 1938-39 Princeton, NJ are definitely not a let-down! Five out of Five Stars for Mercer Street. When one picks up a murder mystery they expect to find a detective trying to find someone who is committing heinously gruesome acts upon other members of society – leaving every one they come across dead in their wake – this time that is not the case – this time the murderer left one victim still alive, Kate Johnson. This time, that last victim will play party to getting them caught and behind bars. I honestly am speechless with this one, normally I have a lot to stay regarding a book I’ve been given to read and review and this time I was just plum disturbed…I was reading this book during a trying time in society when a reporter and a cameraman were killed right on camera – ironic that the main focus of the killer in this novel is television reporters…irony placed at a bad time. I found when the author went into his mind and his world I was itching to turn around and run – the ability to write at that level of disturbance is just fascinating, makes the reader wonder how in the world they come up with the material..this time I honestly don’t want to know. I found the pace of the book to be a bit slow, Kate’s mental breakdowns, running and trying to catch and or get away from her killer was just stereotypical – found it boring. I think for The Broken, I might have to go for 3 our of 5 stars. Definitely not something I am going to recommend. Heather Hildenbrand and S.M. Reine Camps! Exciting new cover to share Heather and S.M. 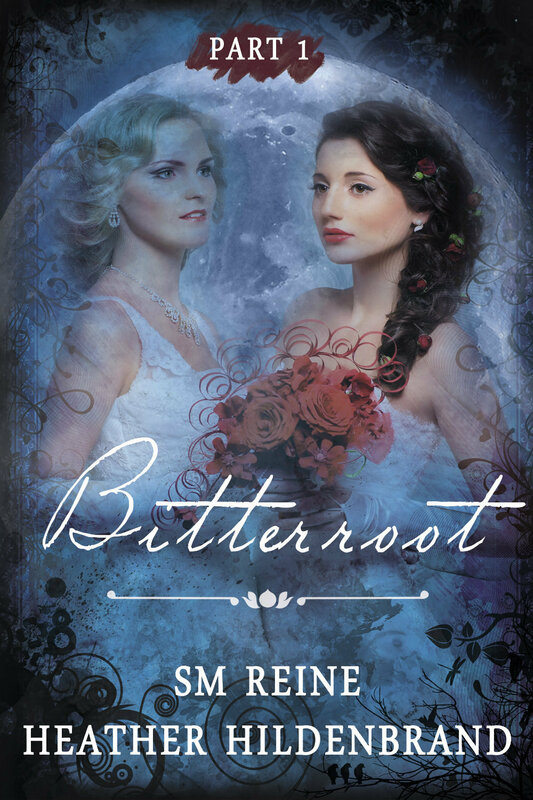 have been working on a Sept release for their new Series BITTERROOT, a YA Paranormal Romance Novella Series! Oh and Hey Book Bloggers – Want to get in on the ARC Read & Review Tour?!?!? Click Here NOW to Sign-Up!!!! “Born into an already-powerful family, Gideon Marquand is a special kind of witch. The most recent in a long line of super-witches, he is the first in over two hundred years to emerge possessing unlimited stores of magic. He is hunted—driven into hiding until the day when he can finally reclaim his rightful place among his family. Magic is something that flows, sometimes it runs high, other times it runs low, sort of like a modern-day trending scenario, they hit their high as the trend breaks and then it fades out with time. In this case the magic that is flowing is Love – any married couple will tell you there are days when you want to hang onto every word your partner says and there are days you want to strangle them – for Gideon and Lauren the latter falls early in their relationship as Lauren’s doing her best to off him as she was directed to do by her “father” and “uncle” however Gideon knows there’s another woman hiding beneath the tough outer layer – the question then becomes how to bring the underlying woman to the surface? A question and task only high family can help him undertake. And, so begins the journey. When I started reading this book I was unsure of the direction it was going to take – coming off reading the 1920 Series – I was trying to figure out how this novel was going to play out – generally one can figure out the direction of novel the minute they pick it up – on rare occasions a reader cannot determine the direction a book will take no matter how hard they try as the author knows how to spin a story. This time it was relatively simple – the author took a rather direct route to get to the end of the book. Though I will say this, I did enjoy the story, even if it was relatively predictable. However, unknown to me at the time when I picked it up this book being the final in a series, the reader is able to jump right into the story and get enough back story re-told to them as Gideon is filling Lauren in on the details that it made following the story easy enough. It can be read as part of the series – or it can be a stand alone novel. I have always loved to read. It’s said in my family that I refused to start kindergarten because I didn’t know how. So my grandfather sat me down, at four years old, and showed me how all those words became amazing stories. All these years later, and I still love to loose myself in the pages of a book. The writing bug didn’t hit me until much, much later. It was shortly after I started working as an office manager in a construction company that a family of witches started clamoring for attention. The next thing I knew, I was writing my first novel. And because these witches insisted on having their stories told, it turned into The Magic of the Heart Series: MAGIC FOUND, MAGIC HIDDEN, MAGIC LOST, & MAGIC REVEALED. Most days my writing is done with at least one of my two little Shorky’s in my lap competing for space with my laptop. They’re only a little bit spoiled, lol. Four out of Five Stars for Magic Revealed as the story line is generally predictable.